The historiography of prisoner of war (POW) publications generally takes the Western or Allied perspective. There are numerous books, memoirs, and articles by and on those who defied their captors, successfully or not. In particular, there is The Great Escape which was truly one of the great mass escapes from a prisoner of war camp, effected by the British in March 1944. 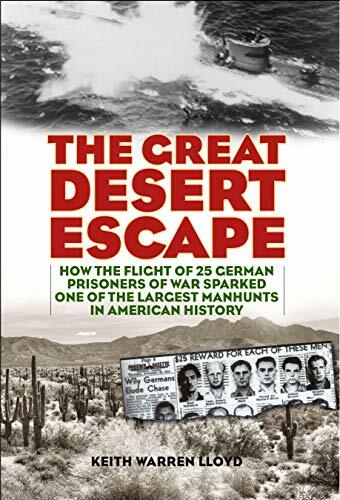 It doesn’t take a very close look to notice that the title here is a takeoff on that exploit yet involves the largest such mass escape of Germans from a POW camp here in the United States, from the Phoenix, Arizona, area to be specific. As unpleasant and undesirable as it might be to be a POW, once one surmounts the initial fear and uncertainty of one’s fate at the hands of the enemy, a prisoner is duty bound by the military code of conduct to attempt to escape. Escape not only can return an individual to friendly force control for purposes of manpower and intelligence, but also obligates the enemy to dedicate its own manpower and resources to recapture said escapee thus impacting that enemy’s war effort. In this case, the Germans in question were primarily members of the U-boat arm of the German navy. They tended to be better educated, more technically capable and, for that matter, indoctrinated in Nazi ideology. As a result, they were less inclined to part with intelligence on U-boat operations and technology, and thus stick together, not to mention to cooperate with their American captors. Unfortunately, as Northern Europeans and seafaring men, they were also less acclimated to the harsh conditions to be found in the desert environment of the American Southwest. However, that did not stop them from trying to escape, generally toward the Mexican border where there was a large German expatriate community that could help support and forward them back to Germany to continue the fight. Just as in prison camps in the greater Third Reich, the men were able to determine certain physical blind spots within the wire along with other security shortcomings. Consequently, they took advantage of what was given them and began digging a tunnel all while producing maps, compasses, and other escape and survival gear to assist them in their effort to overcome the desert environment. Despite the fact that the American military engineers considered the area’s soil to be too hard and rocky for tunneling purposes, it did not stop the Germans from successfully completing their tunnel to a concealed point outside the wire, eliminating the dug dirt and rocks using many of the same methods and techniques as Allied prisoners. As bad as it is having one or two prisoners escape their enclosure, anything above that was certainly considered a mass escape, and this was the biggest in America during the war, involving a manhunt which included the FBI, local and state police and even ordinary citizens. The prisoners were recaptured or gave themselves up voluntarily but not without considerable investment of resources, time, and effort which led to reassignment if not courts martial for a few of the camp’s administration. At least they weren’t sent to the Russian Front as punishment as usually happened in the German armed forces following a successful escape. The photographic section includes shots of the camp, some of the escapees and their ships (not all were U-boat sailors), as well as those taken by the U.S. military documenting the tunnel after discovery. There is one shortcoming to be mentioned here that would have been helpful and that would have been a map of the Phoenix area, showing the location of the camp and the general routes taken by the escapees in their attempts to flee. One will have to look at an available map to see where Papago Park is located and try to imagine the area as it was 75 years ago. Also, there are no footnotes of any kind so one is left with trying to figure out where information from the text was obtained. The bibliography, fortunately, is extensive and includes video as well as published sources. With all of the emphasis on Allied POW escapes over the years, it is interesting to learn about the same from the German perspective, over and above the expected name, rank, and serial number.